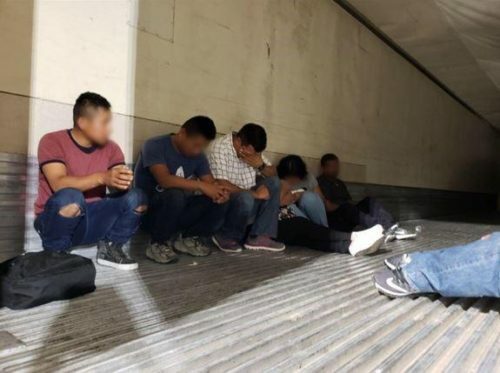 Salton City, CA–El Centro Sector Border Patrol agents assigned to the Indio Station arrested an individual trying to smuggle nine undocumented immigrants locked in the bed of their tractor-trailer Thursday evening. The incident occurred at approximately 9:15 p.m., when a white 2010 Volvo Tractor Trailer approached the Highway 86 checkpoint. During primary inspection, Border Patrol agents questioned the driver as to his immigration status. During this initial questioning, a Border Patrol canine detection team alerted to the rear cargo area of the trailer and was sequentially referred to secondary for further inspection. After further inspection of the cargo area, Border Patrol agents discovered nine undocumented immigrants inside the bed of the trailer. The people inside of the trailer were unsecured with no means of safety. Border Patrol agents determined the trailer’s outer doors were fully-engaged in the lock position. Agents also discovered the interior doors of the trailer could not be open from the inside therefore the immigrants could not exit the trailer without assistance from someone else. Agents were able to safely remove all nine individuals from the trailer. “This is a dangerous smuggling method,” said Chief Patrol Agent Gloria Chavez. “Our Border Patrol agents make safeguarding and preserving human life a top priority.” The male driver, a U.S. citizen, and all nine undocumented immigrants were placed under arrest. The driver will be prosecuted for 8 human smuggling and the nine individuals found are being processed accordingly, the Border Patrol said.